Search engine optimization (SEO) is often an integral part of a long-term website marketing strategy, but Adwords, a paid service by Google, can often be equally important in driving targeted traffic, particularly in shorter timelines. For most businesses, it is a balance of the two that will yield the best results in terms of driving traffic and sales. 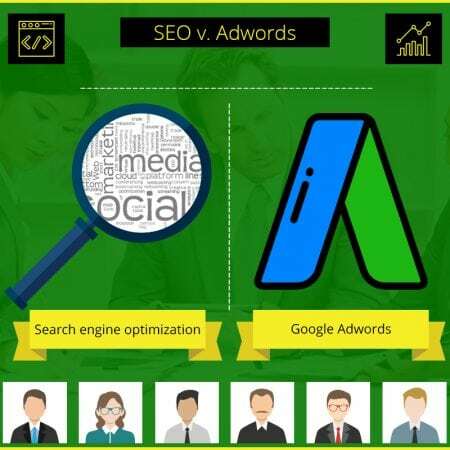 The two methods are quite different with SEO being the driver of organic traffic and Adwords being a driver of paid traffic. While SEO may in some senses by considered free, it really isn’t if you consider the time that is required to fulfill tactics before you see results. Furthermore, even for SEO, you may have to make certain financial investments in order to carry out tactics in order to see results. Over the long run, though, SEO tends to be cheaper and potentially more sustainable. For SEO, you may be spending money on things like quality backlinks (although you should do that carefully), consulting services, press releases, etc. You may even outsource some or all of your SEO work to one of many service providers in the space. For Adwords, your primary spend is going to be directly on bidding for your ads to show for certain relevant keywords. You can choose to be shown directly on Search Engine Ranking Pages (SERPs) or on websites using the Adsense program. Google has a very sophisticated Adwords algorithm to place your ad on sites which are of high relevance and to thwart those who try to game the system by clicking their own ads, etc. You can rest assured that through Adwords, you will get quality impressions. How much it costs you will really depend on your niche and how competitive it is as well as the actual keywords or key phrases which you are trying to bid on. If you do not bid high enough compared to your competition, you may not get many impressions and in turn, it will take longer for you to get enough clicks to use up your funds. Finding the right balance is often a matter of trial and error. Beyond the spend, the other major difference is the timeline. With Adwords, you can build a new website and on the next day start to get high-quality, targeted traffic. This is not very likely with SEO. If you need to drive traffic immediately, then Adwords is often a good idea from the get-go, and potentially serving as a bridge until your SEO strategy really starts to take form and lead to results. Adwords is more the hare if SEO is the tortoise- both are important depending on your timelines and goals. One strong advantage that Adwords also holds is that you can specify the type of audience you want through Google’s interface. In other words, you can target a specific demographic- you can’t do this with SEO since you are just trying to rank for keywords and anyone who searches for those might see your result. With either Adwords or SEO, key performance indicators (KPIs) including return on investment (ROI) are essential to keep track of. Neither is a surefire way to drive sales, so you need to make sure that whatever time and money you are spending to do well in these areas is actually having a positive and notable impact on your bottom line. If not, it may be important to consider revising your strategy to improve the ROI. For most businesses, it will be some combination of the two that is most effective over the short and long runs, but every business and website is different and you really need to take the time to do your due diligence and to experiment and make sure that you are keeping track of what is happening based on what you are doing. Web marketing is often much more an art than a science and so experimentation and trial and error are absolute necessities for success. You may even want to consider other forms of advertising for the short-run beyond Adwords including other pay-per-click (PPC) options or even other types of ads such as Facebook. Again, every site matters. Keep your head up, and keep an eye on the data and you are bound for success.